LOUDON, N.H. _ Tony Stewart walked a fine line between jubilation and empathy Sunday after passing gas-starved Clint Bowyer with two laps to go on the way to a victory in the Sylvania 300. “I know exactly what that feels like,’’ said Stewart, whose second victory in a row vaulted him into the points lead in the Chase for the Sprint Cup championship with eight of the 10 races remaining. A year ago, it was Bowyer who wound up taking the checkered flag when Stewart ran out of gas two laps from the end on New Hampshire Motor Speedway’s 1.058-mile oval. “I know exactly how he feels right now. I saw him slowing down in the back and I thought, `Oh, no. You’re kidding me.’ That’s not the way you want to win it, for sure,’’ Stewart added. But Stewart wasn’t about to give his 41st career victory back, and the two-time Cup champion had no worries about his fuel situation. It was no surprise that Stewart’s No. 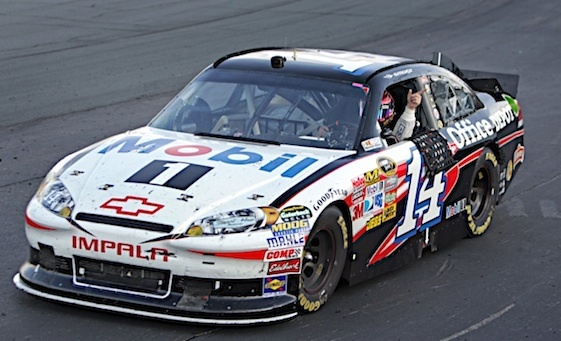 14 Chevrolet was good here this weekend. He has now won three times at the New Hampshire track and finished second behind Stewart Haas Racing teammate Ryan Newman here in July. Stewart, who declared before the Chase that he felt he had little chance to win the title. “The potential’s been there all year,’’ he said. “You wonder when the bad luck string is going to stop. You hope it happens another eight weeks now. We hope we’re through it and we can keep clicking off top fives, 10s. If we could get a couple more wins, that would be awesome. “The thing about this sport is things change week to week. The one thing I think our organization is really good at is taking what we’re doing day to day. I mean, we don’t lose sight of where we’re at today worrying about two weeks down the road. It appeared almost inevitable that this race, like the Chase opener a week earlier at Chicagoland Speedway, would come down to a fuel economy run and that some drivers would get caught out. Bowyer tried to stretch his last tank of gas to 75 laps and came up two laps short. Stewart pitted five laps later than Bowyer and easily made it to the finish, crossing the line more than 7 seconds ahead of runner-up Brad Keselowski. Keselowski, who continues to be the surprise of the season, passed up a chance to pit during the last of three cautions to gain track position and managed to turn it into his sixth top-five finish in the last eight races, including a fifth-place run at Chicagoland. Stewart leaves Loudon seven points ahead of previous leader Kevin Harvick, who finished 12th Sunday, and 11 in front of Keselowski. Greg Biffle, who finished third Sunday, is not part of the 12-man Chase field this year. But he is the only other driver who has won the first two races of the Chase. 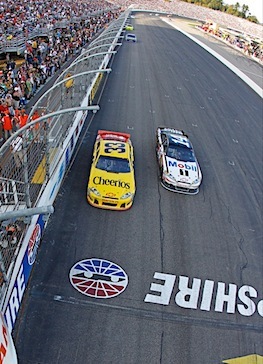 Biffle did it in 2008 and went on to finish third, trailing champion Jimmie Johnson and runner-up Carl Edwards. “It’s certainly a hell of a momentum builder to win the first two races of the Chase,’’ the longtime Roush Fenway Racing driver said. “It just means so much to your team, gives you so much confidence going into all the next races. Stewart hopes Biffle is right. Several other Chase drivers would love to run this race again to see if they could get it right. Jeff Gordon, who led a race-high 78 of the 300 laps, appeared ready to run away with the race before stretching his gas too far and running out on pit lane as he made his final stop. To compound the error, his team failed to get all the gas from both cans into the car for the final run and Gordon had to slow down to conserve fuel for the final 20 laps, dropping him to fourth place. Five-time reigning champion Jimmie Johnson never found the handle on his Chevrolet all day, had a late-race run-in with the lapped car of Chase driver Kyle Busch and wound up 18th, just behind teammate Dale Earnhardt Jr. Junior had a strong car all day, but fell out of contention because of two flat tires apparently caused by a bad suspension setup. Chaser Denny Hamlin, who finished 31st after cutting down a tire at Chicagoland, ran out of gas while running in the top 10 three laps from the end and finished 29th, dropping him 66 points behind Stewart and likely killing any shot at this year’s title. Brian Vickers wound up fifth, with Matt Kenseth, David Ragan, Edwards, Juan Pablo Montoya and Regan Smith rounding out the top 10.